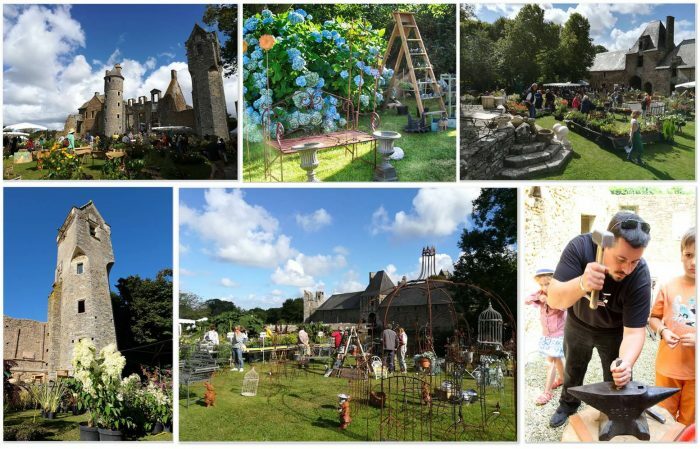 On August 4 and 5, 2018, more than 50 exhibitors beautify the legendary old stones of the Castle. All, from garden amateurs to visitors on a stroll and children, are invited to come and share passion and know how: plants from specialized nurseries or even collectors, garden tools and accessories, antics and modern furniture, outdoor decorations, savors of our soil, pottery, advice from associations and friends of the gardens and art creations. A propos de jardin: Saturday August 5 and Sunday August 6, 2017 from 10:00 am to 07:00 pm. Advices and garden friends: associations, “meet the ducks”, .. Adults €5, €1.50 / 10-18 years old, free for children under 10. Opening of the Saint Gerbold Hermitage: Free visit on both Saturday and Sunday afternoons of the inside of the building. Sunday August 6 at 03:00 pm: guided tour on foot from the Castle to Saint-Gerbold (ticket for tour with professional guide and Castle entry fee: €7 / adult; €3 / 10-18 years old). Free parking – Beverages, snacks and delicacies stand.